The tiny island-chain republc of Vontinalys has been seized by the merciless forces of the Socialist People's Union for Democratic Democracy (S.P.U.D.D.) following the outcome of its first free elections. As a new commander for the League of Nations you must help to lead their elite peacekeeping force, the White Helmets, to victory over the tyrannical military despotism that has ensnared this nation. All the while, getting around the somewhat overinflated ego and reputation of your own leader, Colonel Kraft. 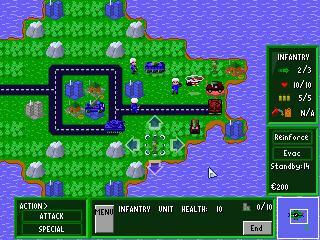 A turn-based strategy inspired by games like the Nintendo Wars series (Advance Wars, Famicom Wars, etc), and the handheld version of EndWar. Featuring: - strategic/tactical gameplay built out of a system for adventure games, with considerations such as terrain, flanking, and supply-line replenishments. - seven different units to deploy - singleplayer campaign, skirmish mode, and two-player hotseat gameplay as either SPUDD, or the League. - four different endings! - brilliant soundtrack composed by Dan Neshor (ShiverMeSideways) - 20% more bears than the next leading strategy! - In-game editor to craft your own battlefields - which you can then share with your friends! So go on - get to the battlefield! The people of Vontinalys are counting on you! "Solid turned based strategy game with wonderful graphics, sound & music. Very minor bugs & no skip text option is its only flaw, but this does not deter from the addictive gameplay. A professionally made game that pushes the AGS boundaries." I gave up after the "joke bear attack" bug crashed mission 5 five times in a row. That aside, this is a great example of what can be done with AGS by thinking outside the box. Enemy AI appears random if you're not close to them but overall a good effort. An excellent strategy game with a large dollop of humour added for good measure. A remarkably fun little time waster. Give it a spin the next time you're goofing off at work.